On finding a delicate way into telling the story of how close we all live to the edge of poverty. After Vivian Kerr had finished up a few drafts of “Scrap,” she took it to a writing workshop in Los Angeles put on by the local filmmaking collective We Make Movies to test it out on an audience and hearing it for the first time herself with other actors playing the roles. For the film about a woman named Beth, who has left her young daughter Birdy in the care of her brother Ben, while looking for work so that she won’t the two won’t have to spend another night living out of their car, getting the tone just right was of paramount importance, and Kerr was taken aback by the response. The writer/actress knew she was onto something with “Scrap,” particularly when over the course of writing it, the homeless situation in Los Angeles only worsened and rather than focus on those have abandoned all hope of climbing out of poverty, she uses the short to pinpoint the moment where it can all fall apart, catching Beth (played by Kerr) desperately scramble around the city, piecing together the amenities of a previously more stable life such as free wi-fi to check her e-mail and a place to wash up while attempting to secure a new job. 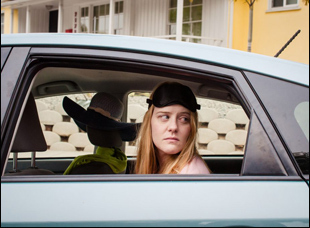 Still, Beth has enough work as it is, keeping up the illusion for her brother (Anthony Rapp) that she’s on a business trip in Atlanta while her prospective employer is led to believe everything is fine at home, unaware that that is currently her Prius. Directed by Leena Pendharkar, who brought a light touch to the the wrenching pregnancy drama “20 Weeks,” “Scrap” shows how fragile even the most seemingly steady of domestic situations can be and how one can become their own worst enemy as economic pressure mounts and surrounded by remnants of their past life, they refuse to fully acknowledge their present situation. With “Scrap” recently making its world premiere at the FirstGlance Film Festival en route to screenings this week at the Beverly Hills and Phoenix Film Festivals, Kerr spoke about how she was drawn to the subject of homelessness, finding the right creative team to tell this story and using a car for the film’s primary set. It was over three years ago that I even wrote this, but I live in Hollywood and if you’ve lived here for the last decade, the homeless crisis has gotten so much worse over the years. There’s actually a CVS that’s not too far from my apartment and I remember when I first moved here, I would go there all the time, but it’s pretty sad how while certain areas have gentrified, other areas have become tent cities. The L.A. Times actually did a series of articles this last year because it had gotten so bad. Essentially, and they reported that in the last six years, the number of homeless people in Los Angeles increased by 75 percent, which is insane. It became very noticeable in the neighborhood I live in, [where] a lot of people were living in tents, in cars or trailers, or people sleeping on the sidewalks. So started thinking I wanted to write a movie that dealt with that topic, but maybe approaching it from a character who is not somebody who you would normally think would ever be in that situation – somebody who grew up with a normal, middle class American life and then like found themselves really abruptly having to live in their car, if suddenly they couldn’t pay the rent and you felt like you couldn’t turn to your family and your friends. It’s like how do you try and make it work? So that was the genesis of it, trying to see a new angle to explore it. While I’ve never been in as desperate straits as Beth, I could certainly relate to cribbing wi-fi from Starbucks parking lot – what was it like to find those moments where you could show the small but significant ways that poverty shapes her life? Right. We’ve all stolen Starbucks wi-fi, right? [laughs] I remember as soon as I started to brainstorm it, I had this document that was almost like a question-answer list of things like how would you try to be safe about it? Okay, maybe you would park in more upscale neighborhoods. How would you check your e-mail and communicate with the outside world? Well, you would be going to coffee shops that have free wi-fi. Where would you shower and change? Well, you’d still probably go to your gym. I was just trying to walk myself through all the ways you would make this functional, so on the outside at least, no one would have any idea you were actually living in your car. It was almost kind of an experiment in hypotheticals and then I just pulled the stuff that felt the most real to me and put them in the film. How did you build a team for this with Leena and Anthony? We finally got the ball rolling on that a year-and-a-half ago and she had worked on Leena’s last feature film “20 Weeks,” so she introduced me to Leena and after that meeting, I knew I wanted her to direct it. Once we had Leena, we were trying to figure out who we could get to play my brother since that relationship is obviously the heart of the movie. We got really lucky with reaching out to Anthony, who loved the script and wanted to do it, and he had this narrow window in his schedule that worked really perfectly, which was great. And if Sapna hadn’t pushed me to do it, who knows if it would’ve gotten made? She really believed in the story and I have to give her the credit. From “20 Weeks,” I know Leena’s drawn to pastels and the subject lends itself to a more grim treatment. How did you get the right tone, which is lighter than you might expect? Yeah, I think that is Leena’s preference in terms of her style, but when we discussed it, most films that you see about characters that are housing insecure might have an additional storyline about the foster care system or drug abuse and they do tend to be very what we call gritty or dark, so what was interesting about this was that we were interested in that juxtaposition of yes, her situation is extremely worrisome, but there is some comedy in that. [Some of the anxiety] she’s doing it to herself, like she could call her brother at any time and say, “Here’s the truth…” and he’s like, “Oh my God, come stay with me,” but her pride is so strong, which I think all of us have. And there is something inherently comedic about [how] all of us sometimes would rather make our lives harder than ask for help. And it’s funny. I remember at some point I thought we’d have another producer come onboard and I remember she was really pushing for the script to change a little bit and be more of a cliche representation of someone who would be homeless — she wanted the car to be broken down and [for Beth] to not be as well-dressed — and that didn’t interest me at all. I’m always interested in exploring the side of the story that we haven’t seen and for me, that’s about a middle-class person’s journey through being housing insecure. Of course, it’s one thing to write for a car. Was it figuring out the logistics of shooting inside of it and driving it around town? Yeah, I was joking I never want to be in this car ever again because I was in the car for a really long time. [laughs] But actually, I felt really sorry for our amazing DP Daud [Sani], who was also Leena’s DP on “20 Weeks,” because he’s a big guy — he’s over 6’ — and he was scrunched into the tiniest little corners of that car. But that’s the nature of the story and it was actually really interesting because the car was often so cramped and so hot and we had to be careful in there because it was also the set, so we didn’t want to be moving everything around the whole time [because] we were so worried about continuity. So by the time we got to the stuff at Ben’s house, which was at the end of our shoot, it was super-helpful to me as an actor because you go from this cramped, uncomfortable car where you’re so hot and trying not to get dirty and to this house, which is just an ordinary house, but to [Beth], it’s so clean, it’s so big and I could actually sit down comfortably. We shot in three days, which was a little insane. In hindsight, it was insane how fast we moved. and our film is 20 minutes long, so it’s a longer shoot [than most shorts]. We worked it out really well where so many of our locations were in West L.A. and they were very, very close to each other, so for example, the residential street where I first wake up at the very beginning of the movie was like a couple blocks away from the Starbucks, so we planned it out really well where we were wasting time doing these really big crew moves. We were able to get a shot and pick up and move really quickly and just go right to the next place and set up really quickly. But it was crazy. It was 14 different locations and it was definitely a little stressful for those three days. There are already announced plans for a feature – did you have a bigger idea in mind while writing the short? I knew from the beginning that I was essentially writing the short as a proof-of-concept for the feature, so there’s some new scenes and Ben’s life is explored a little bit more, but essentially the 20 minute short is the first 20 minutes of the feature and it develops from there. The short definitely is way more about [Beth] and setting up what her situation is, but the feature is a lot more about the sibling relationship and why they have such a difficult relationship and why she can’t just be honest with him about what her situation is. It’s a lot more exploring the secrets in families and a lot more balanced between Beth and Ben, so you really see both sides and the struggle he’s going through as the sibling. What’s it been like getting this out into the world? “Scrap” will next screen at the Beverly Hills Film Festival on April 3rd at the TCL Chinese 6 as part of the Shorts Block #7 at 6:45 pm and the Phoenix Film Festival as part of Shorts Block A on April 5th at 5:30 pm, April 6th at 3:20 pm, April 7th at 10:05 am and April 8th at 10:15 am. Interview: Josh Stewart on Following His Heart Back Home to West Virginia for "Back Fork"